Influitive CEO Mark Organ was feeling haggard. He’d just raised a seed round for the 12-person marketing technology startup and was rapidly building out his sales department. As the company grew, Organ was becoming increasingly frazzled. He’d forgotten his third meeting in a row and was missing deadlines left and right. His associates told him that he seemed unfocused and wasn’t attending to their needs. They gently suggested he get an assistant. But that didn’t feel right. Organ needed to be several places at once. What he really needed was to be superhuman. Then it struck him. He’d once seen LinkedIn cofounder Reid Hoffman’s chief of staff Sarah Imbach in action. She’d ran meetings with grace and agility, asking the right questions and ensuring that every attendee had a chance to talk. Organ didn’t just need someone to book his travel. He needed someone like Imbach. Someone who could substitute for him in meetings. Bring him the inside scoop from other departments. Take over projects he was too busy to do. Excited, he began to search for a hire. In the four years since, Organ, who previously founded the IPO’d and Oracle-acquired startup Eloqua and serves on the board of Mobify, has gone on to hire three chiefs of staff (CoS). Alums have transitioned to executive-level roles at the company. Influitive, which now has 125 employees, is thriving — and so is Organ. The chief of staff role is starting to catch on in the startup world after decades of being common practice in the military, politics and at Fortune 500 companies. Here, Organ breaks down the three types of people you can hire for this role, and how to scope and choose the best person for this critical job. 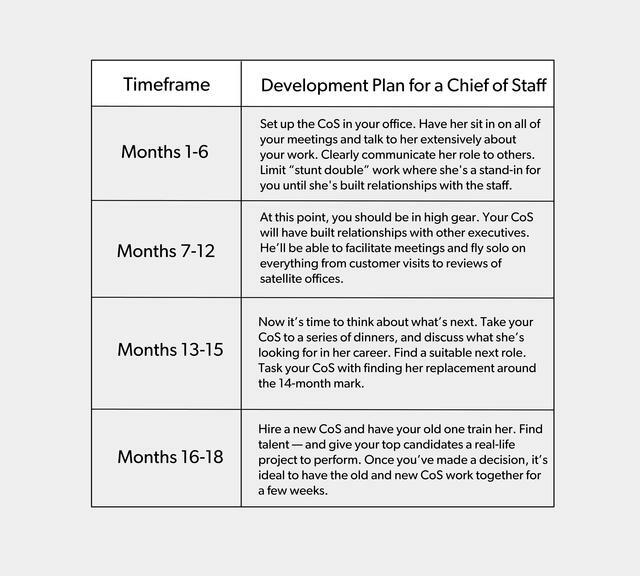 He lays out pitfalls to avoid in the process and gives a step-by-step approach on how to most effectively manage your chief of staff. Organ also spells out when you need a CoS (and when you don’t need one), and explains how to help transition them when their tour of duty is over. Let’s get started. Ensure the CEO is working on the most important items for the company. Help complete priority items for the CEO to an appropriate level of quality. Keep the CEO accountable for commitments, while helping keep reports accountable for results. Keep the CEO accessible and open to new ideas and proposals. Unique to this particular hire is its rotational status. A typical tour of duty for a chief of staff is 18 months at Influitive. After that, they can transition to another role within a company, often in a position of leadership. One former Influitive CoS is now the company’s director of market expansion, while another alum became the VP of Europe after serving as VP of talent. A manager-level hire. This person would be responsible for typical administrative tasks like calendar management and booking travel, but he would also make important judgment calls on how the CEO should best spend her time and what meetings would be most valuable for her to attend. A mid-career, director-level hire. This person may have 6-12 years of experience. He would be in charge of tasks like running town halls, preparing speeches and prepping the CEO for leadership meetings. He’s unlikely to take on any strategic responsibilities, however. An experienced VP-level executive. This person is already an experienced executive who’s looking to become a CEO one day. She may meet with department heads to talk through goals and targets, and work on developing tactics for various parts of the business. Do whatever needs to be done. “It really takes a can-do, will-do attitude to do this job. Some people can’t handle that. It’s not all glitz and glamour. While I would never have a chief of staff do a job that I haven’t done myself, the tasks you assign them can range from high level to basic,” Organ says. “One memorable example is when I decided it would be a great idea to shoot plush unicorns out of an air cannon for a talk at a startup festival. David rented the cannon, bought the stuffed animals and got them shipped to Montreal. It was a big hit, but someone had to handle the nitty gritty of coordinating the stunt. That person was my chief of staff. 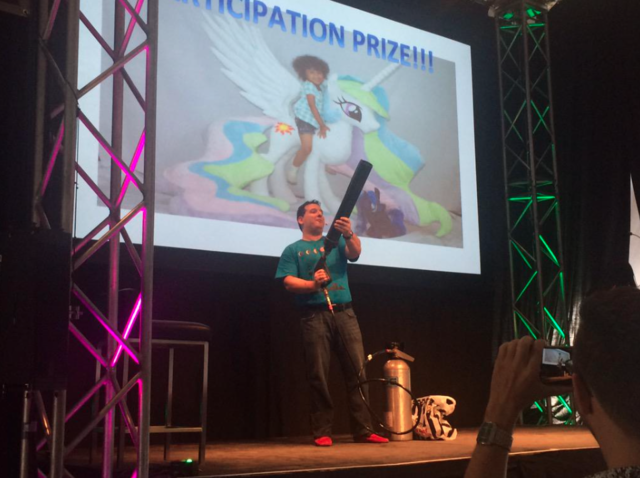 Mark Organ shooting plush unicorns out of a cannon at a startup festival. As CEO, I’m the one on stage. I’m doing the tap dancing. If my chief of staff is doing her job, I get an encore. It can be hard to know whether you need this particular role. It’s possible you only need an executive assistant, or you may need a different executive-level hire entirely. Your team is getting bigger and harder to manage. You’re growing after raising a seed or Series A.
You’re wishing you could multiply yourself and be everywhere at once. You’re harried and burnt out because too much is on your plate. Your employees are pressing you for decisions or deliverables that you aren’t hitting. You want to be more effective but aren’t ready for a COO or second-in-command. You’re very price-sensitive — this hire could cost $75,000-$200,000+. You’re not ready to scale your company. Your executive team configuration doesn’t allow for an effective chief of staff — for example, strong personalities that might prevent a CoS from getting her job done. What’s the vision for myself as a CEO? Where do I want to go? What do I most need help with? What don’t I want to do that I’d like to delegate? Am I prepared to give someone access to every corner of my professional and personal life? What’s the most difficult decision you made over the last year? How did you make it? What’s the worst decision you’ve made in the last year? How did you recover? Tell me about how you’ve been able to motivate somebody who wasn’t particularly motivated. How do you make that work? How do you know that a project is well thought-out? What kinds of questions do you ask? If you have a proposal that’s missing some key elements, how do you deal with that? When do you dive in and help a person produce better work? When do you push it back and say, “You really haven’t thought this through — come back when you’ve thought through this some more”? Dig for answers, but don’t put too much stock in an interview. Your next step is to assign them a project. “It’s very effective. Simulate the job, and have them do it. That’s particularly important in the chief of staff role. For my first CoS hire, we designed an assignment: put together an event for determining Influitive’s product direction. The winning candidate, Fraser Stark, worked with one of our managers to put together this event. After that, we knew he was great. He pushed back on the right things. He asked all the right questions. People on my team who worked with him said, ‘This felt really natural. We produced a much better product with him,’” Organ says. Your chief of staff is your ambassador. He’s your stunt double. He’s the next best thing to you. Influitive's current and former chiefs of staff with CEO Mark Organ. From left to right: David Axler, Mark Organ, Fraser Stark and Bronwyn Smith. After 18 months of being your stage manager, it’s time to let your chief of staff lead. It’s her turn to take the stage. A chief of staff takes control of a CEO’s schedule and priorities. She’ll whisper hard-won insights and instruction into your ear and work to help you lead the company from the shadows. Start to look for a CoS after your seed or Series A. Determine where your needs land on the spectrum between an advanced EA and a VP. Hire the right person by giving them a real assignment, but first define a vision for yourself as a CEO — and suss out what strengths your company needs most at this time. Build the closest relationship possible with your CoS by opening up everything from your email to your deepest fears. A good chief of staff will be a trusted confidante and advisor, but always listen to your own intuition. Let them wrap up their tour of duty by finding their replacement. Transition them to a great role in your company that aligns with your needs and their desires, and then get ready for your next CoS hire.